A version of this review appeared in Art in America. Infinite Patience draws together three artists who have been developing their approaches and iconographies since the 1970s. What unites the artists—James Drake, Kunie Sugiura and Stanley Whitney—is a "not-quite" sensibility, a willingness to resist categorization. In the 1970s, that would have been a more pronounced problem than it is today; figuration and abstraction were still seemingly at war, while pop art and photography made their own encampments. Kunie Suguira, in work dating from 1969 to the present, fuses photography and painting—showing prescience for today's multi-platform, multi-media approach. In five of the eleven works shown (the canvases range from 37 x 28 to 60 x 84) Seguira pairs a panel of single-color acrylic with a panel of photo-emulsion or ink-jet. The result is eerily contiguous with design elements that all of us interact with online, everyday. That the juxtaposition was once unexpected or difficult is itself hard to fathom. Seguira's subject matter, couples in coitus and cityscapes, also summon images that have become, through repeated web exposure, a part of our thinking—and Seguira's foresight is unmistakable. 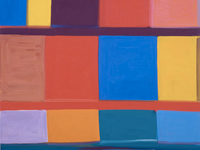 Stanley Whitney's oil-on-linen abstractions are more interactive than the quintessential abstraction of, let's say, Barnett Newman. Whitney's works are "something." Whether in the smaller paintings, 12 x 12, or the larger paintings, 96 x 70, one feels the presence of American crafts—quilting and Native American basket weaving—as well as musical influences. The grids, loosely graphed but painstakingly imperfect, bring to mind the discordant repetitions of Thelonious Monk. Whitney, like Suguira, divined our visual future long-before any of us could imagine it—one screen, one box after another. Regarding Whitney's long-standing latticework, one has the sense not so much of Whitney coming to the world, but the world coming to him. James Drake, showing works on paper from 1996 to 2008, brings a political element to figure-drawing that is at odds with rendering as a "traditional" form. Drake's representations of "Beto Jaurez gets High" and "Fat Boy" investigate a pathos that is contemporary and utterly divested of historical reverence. Except to say they are not small, the works have no set scale—the largest work is huge at 114 x 80.15—and no set methodology. While most of the works are charcoal/graphite drawings, with riffs of canvas, tape and photocopying, two of the works, "Chandelier" and "Scorpion with Insects," are paper cutouts. Always, Drake is pushing aside the viewer's attempt to attach some comforting pretension to the work. In the single sculpture of the curation—nickel-plated steel tongues stick out from the wall—Drake scorns the effort.